Arch Hades: 'European' ancestry in the Ashkenazi Jews is predominitely South European. You asked about Corded Ware pigmentation on Polishgenes. Here it is. This somewhat similar study claims that Ashkenazis have rather medieval Flemish admixture. Looks like that's just modeling them as two way mix of 'Middle Eastern' + European, and the 'European' reference is Flemish. 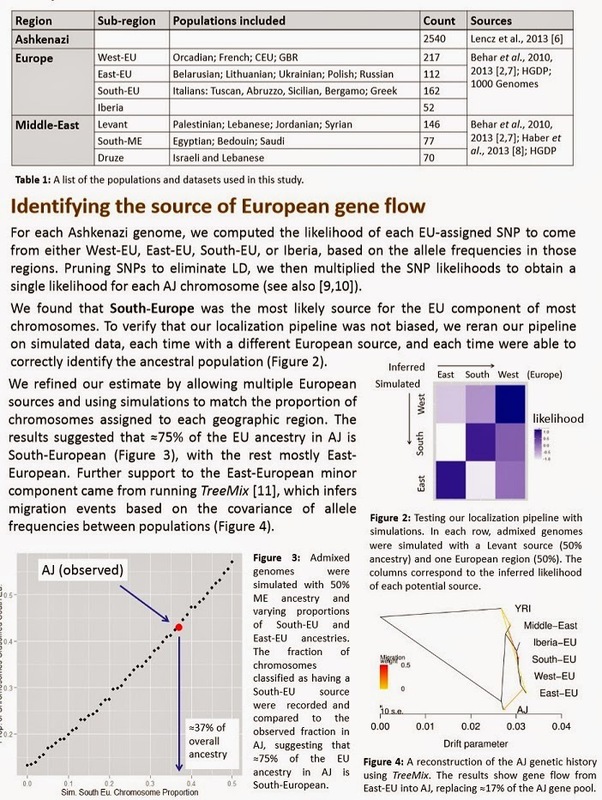 That might be an effective model, but a model that includes all Europeans as data point references (and not just 1) from North to South and East to West is much more rigorous and detailed, and it shows the dominant amount of their European derived ancestral alleles stem from the Southeast, probably Italy. I certainly agree with the south-European origin of the Ashkenazim, but it seems that the "Levantine" is assumed to be 50%. Why make that assumption. I doubt it is anywhere near that; the Levantine or Middle East origins of the Jews of Europe was already washed out; whatever Levantine origins there are comes through the southern European origins-The Italians and Greeks.